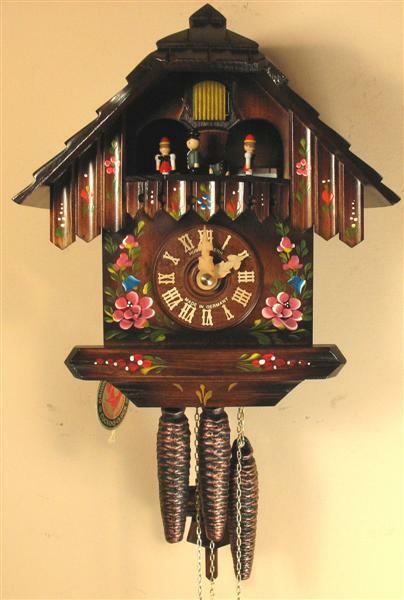 This charming and inexpensive cuckoo clock plays music while the animated dancers go around and around. When the clock strikes the hour or half-hour the door opens, a cuckoo appears and calls along with the clock’s gong strike. After the cuckoo is finished a Swiss made music box movement plays a tune. This clock is hand made in Germany and is distributed by North Coast Imports. The mechanical brass movements are driven by three weights and time escapes with the tick of a traditional pendulum. The cuckoo call sound is made by two mechanized wooden whistles with bellows inside the clock case.